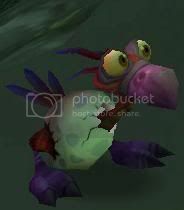 This pet ( http://www.wowhead.com/?item=32616 ) is obtained by completing the 2007 Children's Week quest line. This is really cute pet. Always running around and half of it body is still in the egg :3. That makes it really cute. 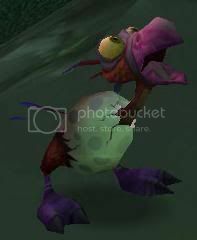 Another great Non-Combat pet in the game. You obtain it after you do Children's Week in Outlands. You can either get Egbert, Willy, or Peanut the Baby Elekk. I personally got Egbert because he was so cute! He runs around like crazy occasionally, and you can limit the speed that he runs. Just press the / key that is above the Numberpad, or if you have a Zboard with the WoW board, press the Run/Walk key. As Egbert is an uncommon quality pet, I was wondering if anyone has used a battle stone on him and, if so, what their thoughts were? Not sure if I want to waste a stone on him, as he's pretty lack luster as is. But he is adorable. I used a battle stone on him, and I like it. He is level 17, and is currently matching speeds of pandarian level 25s. Well the crap quality ones anyways. But thats pretty good for being 8 levels behind. Whatever you do, do not have this pet out near a raid boss. If he spazzes out and runs close enough, he will pull the raid boss.... Although if you want to mess with your raid once I suppose you could do this and see how far you get the boss down. A good name for this little fella is John. For developers looking for this pet's species id it's 158.
" The sin'dorei use hawkstriders as mounts, but this little one was deemed unfit after being diagnosed with numerous anxiety disorders." One of the pets that counts for Non è carino? which is part of the meta Per i bambini...'s Week. If you're looking for a Critter with the same moves - see Cucciolo di Mulgore. Questo PNG si può incontrare qui: Shattrath. I Sin'dorei solitamente usano gli zampalesta come cavalcature, ma il povero Egbert non è stato ritenuto idoneo a servire a causa dei suoi numerosi attacchi d'ansia.